Item Number: 810-488 18379 Actual Weight: 0.5 lb. Prevents accidental reconnection during maintenance or repairs. 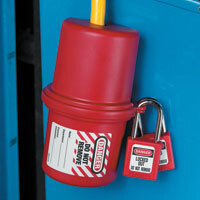 Outer shell surrounds electrical plug and locks with padlock. Outward/inward rotation allows for use in confined spaces. Tough, lightweight and works well in extreme conditions and temperatures from -50°F to +350°F. Fits electrical plug sizes up to 3" diameter x 6" with cord diameter up to 3/4", this includes most 220 and many 550 volt plugs. Padlocks sold separately.